The Hamilton Santa Claus Parade Committee is very proud to introduce the new parade route for the 2017 Hamilton Santa Claus Parade. This has been in the works for quite some time. Together with S.E.A.T (Special Events Advisory Team) the route that we have had for more than 20 years has become too costly (permits, HSR and traffic concerns) as well as the City’s new Light Rail Transit System that will have both King and Main Streets under heavy construction within the next few years the change in route needed to happen. 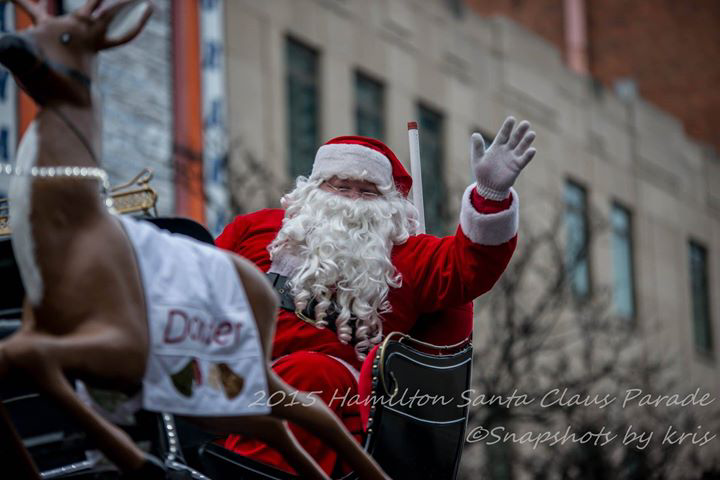 We will continue to have the Santa Claus Parade in the downtown area and accessible to all. We hope that you like the new route and that everyone embraces it. Below is a map of the new route. We look forward to seeing everyone on Saturday November 18, 2017 at 4:30pm. 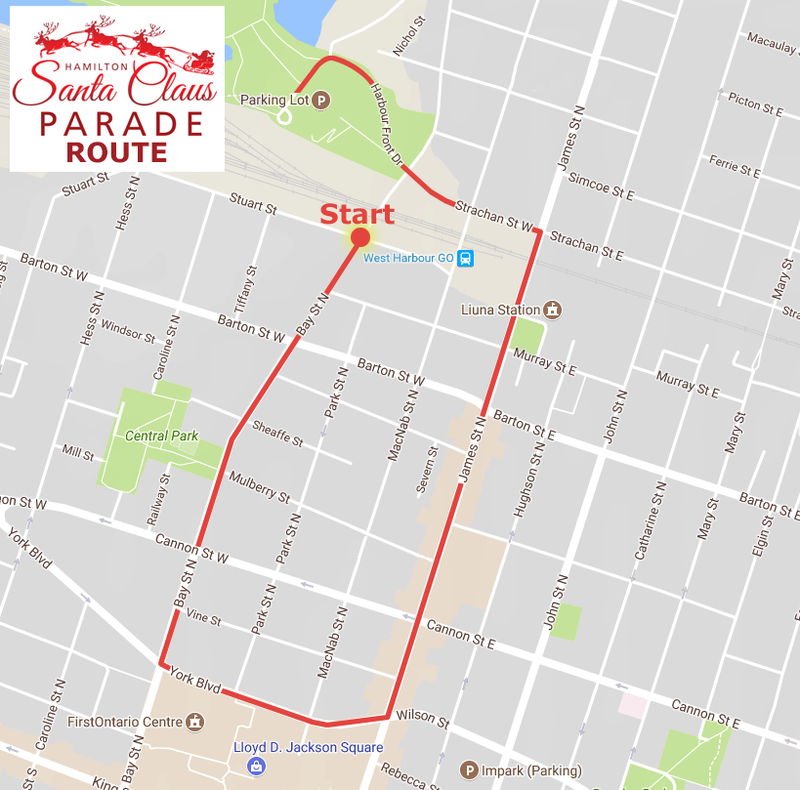 The Hamilton Santa Claus Parade Committee is pleased to announce that this year’s parade will take place on Saturday November 18, 2017 at 4:30pm. The parade route is changing this year and we will be sharing the route with everyone in the next couple of days. We will be posting a map with the new route highlighted. So be sure to check back in to see our new route. 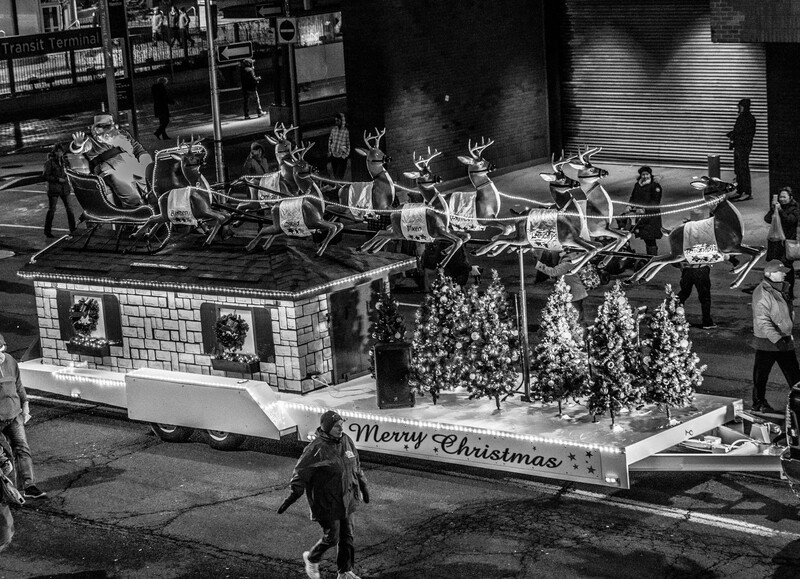 With the end of the first month of 2017 drawing to a close, all the Christmas decorations packed up and put away it is time for us to reflect on what a busy and successful 2016 Christmas Parade season the Hamilton Santa Claus Parade Committee had. We would like to thank all our volunteers, sponsors and parade participants for a great Hamilton Santa Claus Parade on Saturday November 19th. The new start time at 4:30pm was a great success and we are so happy to have brought a night parade atmosphere to Hamilton. Having participated in many other communities night time parades in years past we were looking forward to presenting it to the residents of the City of Hamilton and the response was awesome. The residents enjoyed the parade, the children were excited and full of smiles as they patiently awaited the arrival of the man of the hour “Santa” under the lights. The floats were all lit up, participants were full of Christmas spirit and the bands performed to perfection. Santa told us before he left for the North Pole that he rather liked the night parade here in our fine city and commented how much he liked his “updated” float. He also said that he is looking forward to returning to see us all again in November and hopes that we do another night time parade. Santa, we are making arrangements to do just that this year!! Now with a bit of a break behind us we begin to work on getting things organized for this year’s parade.